6.69" x 4.4" x 1.42"
Other Thoughts: Was looking for a mid-range card for my budget build in 2012 and this card looked alright. It performed OK, but the resolution from the HDMI output was always off (tried multiple monitors and even threw the card in a different box, same result - black bars or a stretched picture on monitors that were native 1080p). The issue never went away with driver upgrades, and I mostly used a VGA monitor on the card anyway (which worked fine? ), so I never really investigated further. Fan was louder than I was used to, but it managed to keep the card cool. In the past few months, my PC would bluescreen and throw fault codes related to the graphics chipset on occasion... about a week ago, the card died completely. Not really upset, I got my money's worth out of it, and it was time to upgrade anyway. Other Thoughts: I bought this for my budget build, which ran me $500. This card has been my workhorse for overall gaming and photo-editing. It runs cool, and never goes past 84F, which is pretty amazing since I do a lot of extensive task on this computer. My only complaint is that it has a bit of problems running with AA, such as I can run skyrim on ultra, but only if I turn off the AA and AS. Same goes for Arkham City. Battlefield 3 runs quite nicely on it. Pros: It runs every thing within reason. Don't expect to run D3 or SCII on high settings. But it handles LoL on everything high flawlessly. Cons: None if you have realistic expectations of it. Other Thoughts: I've owned this card for almost a year now, and it hasn't let me down in any way. I would recommend this for somebody looking for an all around computer that can do some light gaming, which is what I ahve it for. Outperforms any console currently on the market at HD (1080p) resolutions. Every time I turn my TV off (I use my LG LCD 42" TV as a monitor) I lose sound and have to pull the HDMI cable and re-connect it to get sound again. Very annoying. Other Thoughts: This is my first time adding a graphics card to me my PC. Been wanting to do so for a while and finally had the spare cash to do so. Most of my gaming was on PS3 and 360 but that's about to change now. I can finally run L4D2 that I purchased on Steam last year - on max setting no less (my onboard Intel chipset couldn't even do it at 640x480). Pros: Hooked my PC up to my 32" inch Monitor and runs pretty well. I do play Company of Heroes, Sims 3, War Craft 3, Skyrim, BFS with 40-50 FPS. Which is pretty good to me so far. Cons: Just a little bit of Lag here and there. Other Thoughts: Remember SSD's 120GB or above is HIGHLY RECOMMENDED. Please do some research prior to purchasing SSD's. Thank you and have a Motivated Day. Semper Fi. Pros: Cheap; will run most modern games well at medium quality or meh with lots of screen tearing at high quality. This is not a bad card but it's not a great card. Pulls power from MB. Cons: Fan is clipped on for added cheapyness and came off in shipping; clipped back on and works fine. 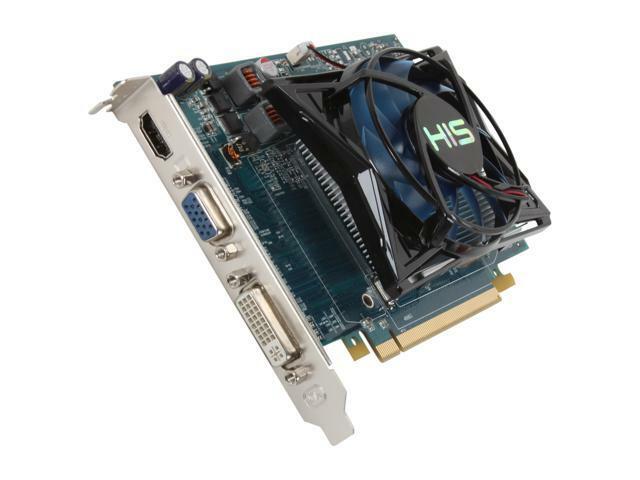 If you games require lots of graphics power, I would move on to the next card on the list. Other Thoughts: I understand that the other PC specs will affect the graphics card. The system this card is in has a AMD FX-6100 CPU in an ASUS M5A99X EVO MB. I do casual gaming and this is a casual gamer card. This card is nothing special but it's not bad either. It's worth the price and you get what you pay for. Pros: Per usual Newegg ordering/shipping was fast and accurate, received my package within three days. Un-boxing was fun, comes in a fun packaging that makes you feel like you won something, always nice. Installation was a breeze, one of the reason I bought it was the limited power needed and lack of a dedicated PCI power cable. Software installed quickly, the Catalyst program is straight forward and easy to use with a nice warning when you unlock for overclocking to scare off people new to the process. Performance is impressive for the price, definitely a nice mid-range card that's very quiet and even overclocked is staying surprising cool. We'll see how it holds up in the long run, so far you'll be hard pressed to find better for the money. Cons: Not really a con, but be aware of the height it may surprise some people with slimmer cases. Pros: Good price for the performance. Runs quiet and relatively cool. Bought this to replace a crossfire setup of two HD4850s. Bumped me up to the newest Direct X and also provides more performance. How can you go wrong for this price? Cons: Not really a con, but this is NOT the crossfire version of this card. This is for a one card setup.